Once again, Canadian equity investors are fatigued. Lackluster returns from the S&P/TSX Composite Index and an endless stream of negative headlines emanating from around the world have contributed to growing investor frustration. With negative returns in 2011 and little bounce so far this year, 2012 may be the second year in four years that the S&P/TSX Composite Total Return Index has disappointed investors. “What is going to happen to Greece, Spain and the rest of the European Union? Instead of focusing on the noise caused by global imponderables, focus on building an investment portfolio consisting of companies that can grow their dividends. Focus on growing income. 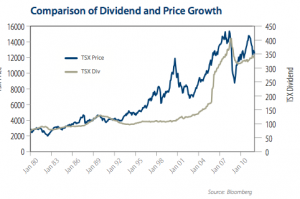 Although Leon Frazer portfolios were sheltered from much of the frustration in the Canadian market over the last 20 months, their modest returns do not reflect the impressive dividend income growth seen since 2010. 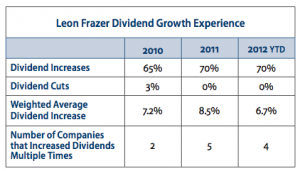 The fact that Leon Frazer’s “backbone” companies continue to grow their dividends at a time when market uncertainty remains so high is a source of great comfort.